High ratio 1.3:1 rocker which provides 30% total extra valve lift. To be used with eithers 18Lbs or 26Lbs Valve Springs. Very simple 'Bolt in' upgrade, which offers huge increase in performance. One of the best 'Bang for ya buck's' available. Use with our .275" Camshaft to have a total lift of .357.5"! 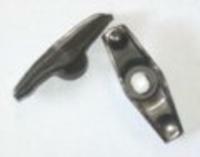 10% High Lift Ratio Reinforced Rocker Arms. Fit exactly the same as stock OEM rockers. 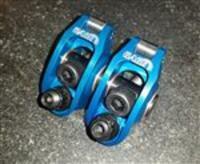 Pair of 30% High Lift Billet Rocker Arms. Suitable for use with Heavy Spring Pressure Dual Valve Springs. The best Non-shaft Rocker Arms on the market. 1.3:1 (30% More Lift) Roller Rocker Set. The best rocker setup we sell.